Here’s just one snapshot of the aftermath from rioting & looting in Ferguson. 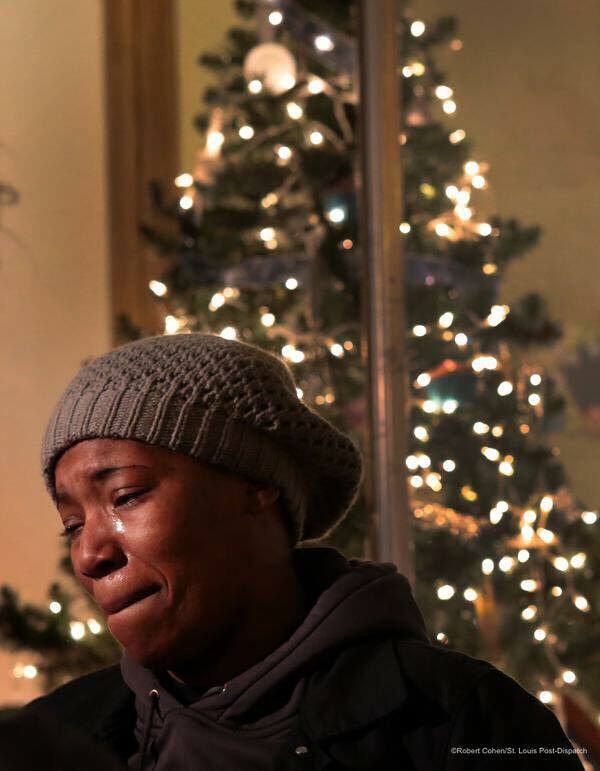 Natalie DuBose crying after looters attacked her cake store to get “justice” for Michael Brown. She sold her cakes at flea markets to save up to own her own shop. ~ Via Josh Jordan. So explain to me how this woman’s cake shop had anything at all to do with Michael Brown. I mean, obviously she must have done something to warrant the folks in her town tearing it up? No? I have a ton of thoughts about this entire case, but frankly, this case is all we’ve been hearing about for days and most of what I would say has probably been said elsewhere. I will say this, though. You wanted justice. You wanted to have your “race war” or whatever the hell it is. You want civil rights. How is destroying your town doing that? How is it justice for anyone when you are destroying the lives of people who built your town, keep your town alive, and committed no wrong against anyone? People like Natalie are dreamers – real ones, not the BS dreamers who jump fences like ninjas and want us to give them everything for existing. She fought for what she has, and as a small business owner, she has to keep fighting every day. She didn’t kill anyone. She didn’t commit any crimes. She isn’t a threat to your civil rights or your justice. She’s a woman with a cake shop, living a dream. She is civil rights. She didn’t get that handed to her, she went out and got it herself and she worked damn hard to do it. And now you are destroying it. Why? Isn’t she exactly what you claim to want?! Instead of destroying her, why don’t you emulate her? Instead of destroying your town, why don’t you build it up the way Natalie and others like her have done? Natalie and her kind are the people who keep this country moving. They embody everything that is right about this country and everything this country was meant to be. Stop tearing everything down and try building it up. People listen to the builders, not the destroyers. The builders actually get things done. If you feel you’ve been wronged, nothing burns your enemy as much as watching you succeed. So stop the madness and build something instead. This entry was posted in America, Current Events, Personal Freedom, Personal Opinion, Race Issues and tagged Ferguson, Ferguson Riots. Bookmark the permalink. That would require honest work and time…not instant gratification.